Hidden Crown sent me their new Crown Clip Ins and I just had to do a review because I loved them so much! I am not receiving compensation for this post. I am a huge fan of Hidden Crown hair extensions. Every time you see me with my long hair this past year, I have been wearing the halo extensions. It is a staple in my beauty arsenal. Seriously the easiest hair extensions ever! 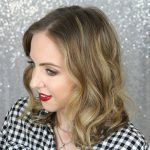 If you missed it, I did a review and video on the Hidden Crown halo style extensions last year, and I am still loving them. It’s basically a big hair piece on a wire that sits on your hair and you pull your hair over it. When Hidden Crown released their new crown clip-ins, I had to get my hands on them. And I did! So here we are with a Hidden Crown Clip Ins review. I’m going to be going over every detail and question you probably have, as this is very in-depth! I know buying hair extensions is an investment and I spent a lot of time researching. I hope this makes your research easier and helps you make a decision! The thing that makes the Hidden Crown clip ins so unique is that it is only three pieces that you clip into your hair. There is a back hair piece with two side pieces. It doesn’t even matter which side piece you place where! Now that’s what I’m talking about. I think it’s best to just watch how these babies work, so I did a whole video on it! I’m also comparing them to the original halo extensions, so you can make a decision on which one you should get if you are trying to decide. Hope you find the video helpful! If you need help finding the perfect color match, make sure you send in a photo to Hidden Crown. I did this before getting my first Hidden Crown, and the color was a perfect match. No need to get it colored by my stylist at all! I had to get my halo extensions cut and layered a bit to blend better in with my short hair (last year), but I did not cut my clip ins at all. My hair is also a lot longer this year. Just a heads up so you know before ordering! I know I mentioned all of this in the video, but I thought it was worth recapping here in the post. I’ve been asked which extensions I like better, and that really is a hard question! I do love both and wear both. Here are a few comparisons I mentioned and some I did not mention! The halo extension is one piece of hair on a clear wire. The clip ins are three pieces. The halo extension is heavier than the clip ins. The halo extension has more hair (unless you get the Daydream). The ends of the hair are also thicker. The halo extensions have 140 grams of hair and the clip ins have 100 grams of hair. The clip ins ends are tapered slightly on the side pieces but the back piece has fairly thick ends. The halo extension is $100 more expensive than the same length for the clip ins. Remember, it is significantly more hair. I hope you find all of that helpful. I am absolutely loving my Hidden Crown Clip Ins and am wearing them all the time! Again, be sure to go watch my video I did from last year on the halo extensions so you can get a complete education on Hidden Crown! Hair Hack! How to Curl Hair in 5 Minutes (or Less)!